Lanu Uliuli Pa’o! Black Noise! In Lanu Uliuli Pa'o! Black Noise! artist Lonnie Hutchinson hand cuts intricate imagery onto a large scale paper panel. The works record her time in Samoa while on a Creative New Zealand artists residency programme. Hutchinson’s lace-like cut outs of the local landscape chronicle a story of bird watching in the day and star gazing at night in a personalised panorama of her mother’s homeland. Waiting for Le Ma’oma’o, a long panel that wraps the gallery wall, represents the artist’s daily search for the elusive and endangered native birds of Samoa, the Ma’oma’o and the Manumea. Both birds are on the brink of extinction due to introduced pests, habitat destruction caused by cyclones in the early 1990s and agricultural land conversion. Another focus during the residency was observing the sky scape above Samoa. Hutchinson could not record the Milky Way without noticing the vast amount of satellite traffic. Both subjects proved challenging to document what this highlighted for Hutchinson is the effect of contemporary life on local ecology. 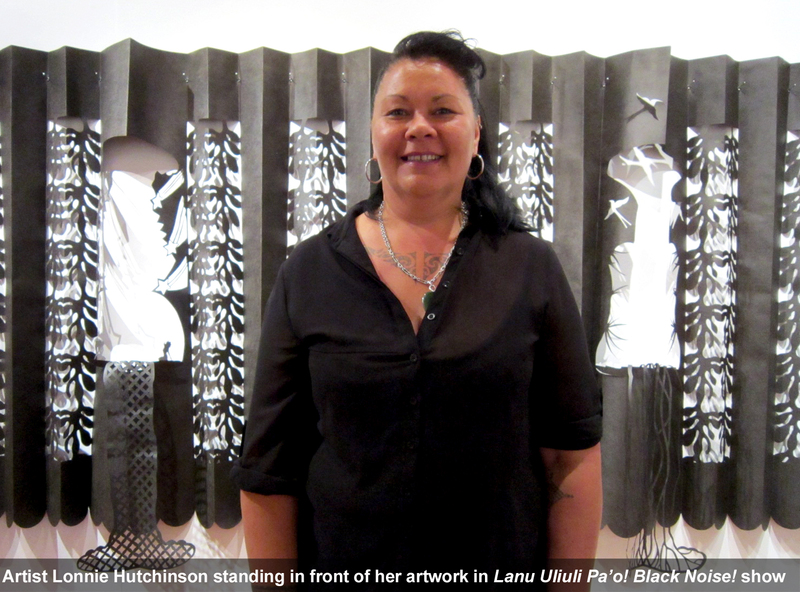 Hutchinson is informed by Samoan and Ngai Tahu ancestry; her works draw visually from both Polynesian and Māori architecture and art forms such as siapo – tapa, weaving and koru motifs. In these tukutuku-like panels and works in paper, the artist explores the evocative relationships of light and shadow, space and place, the traditional and contemporary. Lonnie Hutchinson is an Auckland-based artist with a multi-disciplinary art practice that includes, sculpture, installation, drawing, moving image and public artworks. Her latest public artwork, Te Waharoa ki te Ao Mārama (The Entranceway to the World of Enlightenment) has just been unveiled at Hamilton Lake. Hutchinson’s work can be found in the public collections of Auckland Art Gallery Toi O Tāmaki, Christchurch Art Gallery Te Puna O Waiwhetu, Queensland Art Gallery, Australia and National Gallery of Australia.